Online TV viewing: Who is doing the viewing? BARB’s TV Player Report has been providing device-based census data about online viewing since 2015 – from the UK population at large. From 2018, BARB will tell us exactly who is doing this online TV viewing. This is the outcome of Project Dovetail, which links the device-based census data to BARB’s people-based panel data to provide the UK’s only authoritative source of the demographic profile of online TV viewing. While BARB hasn’t yet been reporting this information, we have been gathering it for some time and so we can share some findings from the BARB panel on just who it is that is viewing on PCs and tablets (we don’t yet record viewing via smartphones for the BARB panel). These data are taken from the whole of 2017. This first chart shows the gender and age profiles of online TV viewing. Looking at total online TV viewing, we can see that it skews to women more than men (perhaps challenging the convention that men, as TV’s lighter viewers, might have been more likely to turn to online viewing), and to older audiences too. However, when compared with traditional TV set viewing profiles, the online picture is more as we might expect. Children’s share of online viewing by device (8.4%) leads their share of traditional TV set viewing (6.5%), while 16-34s take a far higher share of device viewing at 24%, compared to 15% of that via a TV set. Figures match more closely for 35-54s (taking 33% of device viewing and 28% of TV set viewing), while the over 55s take 51% of TV set viewing, compared to 35% of device viewing. Adults in the prime of their working lives, possibly pre-parental responsibility, and most likely to be out and about, appear to be the group whose online viewing behaviour is diverging from their TV set behaviour most sharply. But age does seem to drive different viewing patterns – we see that older people are more inclined to view live, while viewing on-demand satisfies the desire among younger people to view when (and where) they want. 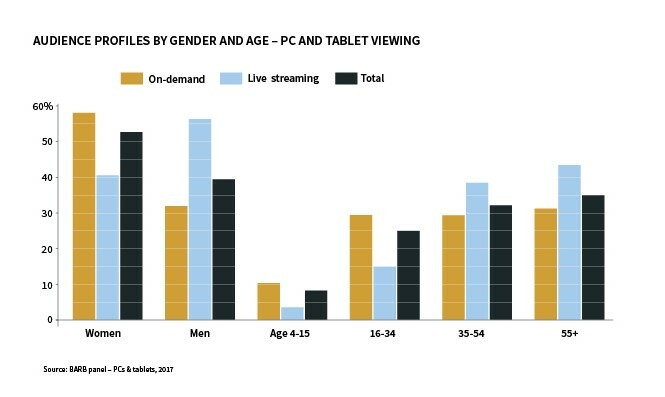 We can see a gender difference too between on-demand viewing and live streaming, with men much more likely to view live – largely driven by their interest in sports programming – and women more likely to catch up with their chosen programming on-demand. This is in keeping with long-established genre differences between live and timeshifted viewing. Patterns of online TV viewing over the day bear a strong resemblance to the shape of TV set viewing generally – dominated by evening viewing, although a little later than traditional TV. 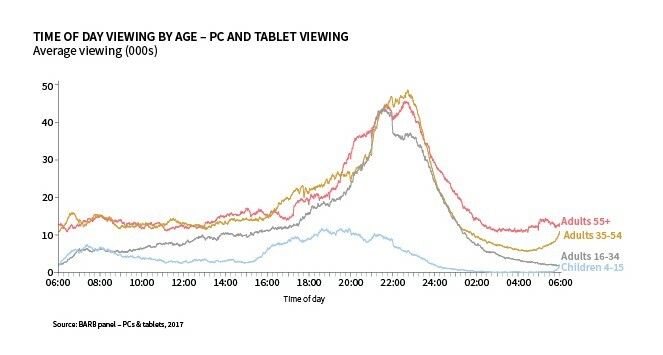 The peak in online TV viewing for adult audiences is between 9-11pm, which builds earlier (from around 8pm) for older audiences (55+), but is concentrated into a shorter, earlier peak (9-10pm) for younger adults (16-34). This 9-10pm spike in young adult viewing (followed by a sharp drop) is accounted for by live streaming to Love Island (in June and July) and I’m a Celebrity (in November and December). With fear of missing out (and of spoilers on social media), these reality series are clearly something you have to see live. These articles on online TV viewing have given us a glimpse into the new insights that Project Dovetail will bring in 2018. Soon we’ll be able to compare – across on-demand, live-streaming and linear – the viewer profiles of schedule stalwarts like EastEnders and Coronation Street that dominate the rankings in all environments, and see who’s viewing what.